Being old admirer of Palm, passing from model to model, I specially postponed the next inevitable upgrade of my handheld computer up to the coming out of the full-function device on the basis of 5.0 OS. Last time Palm Company began to lose strongly their positions in the market of pocket computers and I did not doubt that the premiere will be something worthy. I was not mistaken, engineers and designers have worked on glory. 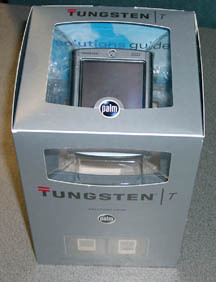 Probably, Palm Tungsten it is possible to compare with the coming out of the first PalmV models, for time being the real revolution. You can't name Tungsten, certainly, revolution, but, standing on a show-window, among similar devices, it, certainly, draws attention. First of all you pay attention to it. Despite of a folding construction, Tungsten has turned out marvelously integral. It densely lies in the hand, it's rather wide and thick. Nothing sticks out anywhere:-). At weight in 157 grammes and the sizes 101,6 х 76,2 х 15,2 mm it can be named even graceful. The dark aluminum case gives to it rather aristocratic kind. Color of the covering is not grey, and more likely bluish, you know, such have fresh removed metal shaving. Probably and the name - Tungsten - sends first of all to color of the case. The top and the bottom surfaces, and also edging on a circle - plastic, matte-black. I will repeat all is very strict. 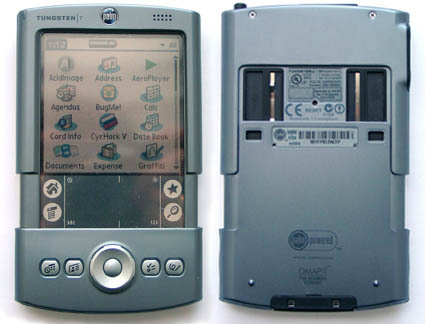 Some additional elegance to the handheld computer gives full color convex Palm badge on the forward panel above the screen. 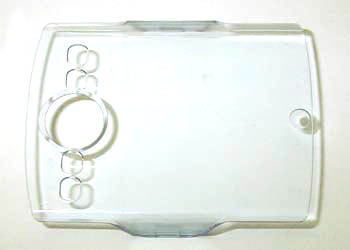 The driving off bottom part of the case slides softly, and is fixed with some additional effort and easy click. All design is executed on skid (they are visible behind, in the spread out condition) so bending parts are not present, and, accordingly, grows the reliability. The most unsuccessful part in the design is the transparent cover on the screen. In the theory, it should rigidly close the screen and provide protection. I even did not get it from the box, so much useless construction it is, in my opinion. It, certainly, protects the screen, but in the closed condition it does not give access to buttons, so in any case, it should be removed. Well though is thought over the opportunity to fix it from the return side of the computer. But, frankly speaking, there was more use from the "crusts" of 500-th series, than from it. Especially because the completely separated part from the construction it's easier to lose. The stylus appeared unexpectedly pleasant. This powerful metal feather, silvery and heavy, with the developing top, fixed rather dense in groove with the help of magnetic latch. Stylishly and with taste. Basically, are executed under classical circuit of Palm, but engineers have added to vertical also horizontal scrolling. The group of buttons "has grown together" in joystick which, to everything, fulfils also the central pressing - input or action confirmation. The same button starts clock on the switched off device. Now Palm Tungsten became more similar to the multimedia device - the similar manipulator is rather good for games. However, it helps fine at dialogue with Tungsten with one hand. In the piled up condition it, joystick, remains the unique high-grade control. Up to JogDial module it, certainly, is still far (and why Palm ignores the lateral scroll button?) but it is a big step forward in comparison with that was. The power-on button is on the top panel at the left, in the same place, from above, the infra-red port, the stylus, the MMC-slot settle down. From that few new that was added in new model, is the button of sound recording – it is allocated at the left end face. In the same place, hardly higher, nestled the microphone. Not the most successful arrangement - it is possible, to cover it, not wishing that, with the big finger, by pressing “record”. The speaker is on the forward panel on the right above the screen. Surprisingly, but with the small sizes it shows surprising energy - loudly plays music, clearly reproduces speech. However, if it will be insufficiently - above the microphone there is a socket for headphones with standard tip. In the top part of the case there is LED indicator, as usual, multitask. It answers both for the charge of accumulators and for active Bluetooth, and for silent reminders which, in particular, can notify user with vibration alert. By the way, the opening design has one more feature. It is possible to adjust the computer so, that it was switched on at opening graffiti area, and switched off at closing, so it is also possible to consider it one of the managing elements. In spite of the fact that the version has increased per unit (like, all is serious) for the user the biggest, say, appreciable, improvement became the "legalized" resolution of the screen in 320 on 320 points, updated applications' icons. Work speed has increased too, but it is necessary to thank for that, first of all, the processor which frequency has increased in 5 times! Also the settings menu was overworked. Now it is more structured, divided into groups, it became user-friendlier. Fonts are also drawn again, they began more scraggy, more pleasant for reading. There is no musical player in the standard package. Why - it is not clear. Interestingly, that exactly the player shows one more interesting and the main thing unusual feature of new Palm OS - player can play music in background mode. I.e. you can, read books and listen to music for example. It’s bad that in the background mode of music playing it's not recommended to borrow Palm with any difficult tasks (games, for rxample) - it will be appreciable "brake". One more shortcoming - the battery is spent very quickly at such mode of use. As for work with the Internet, now, on a disk included in the package, there is also a high-grade program for work with e-mail «Versa Mail» and a browser «Web Pro», which unique serious lack is inability to work with Russian. Processor OMAP1510, frequency of 150 megahertz, 4 mbytes of Flash memory and 16 mbyte of RAM. It is strange, that increased appetites of the device were not reflected in the memory increase, in fact the standard for the same Pocket PC are 64 mbytes. Sound support, and also the driver of the screen and SD slot are realized on the basic processor's core. Palm TT it is equipped with wireless Bluetooth protocol that helps it to easily communicate with «brothers on mind» from Palm OS "clan" , cell phones, GPS-receivers, desktop PC's and other large and fine periphery. It is interesting, that software for work with Bluetooth practically does not differ of that, which was with Bluetooth cards of the previous handheld computer generation - Bluetooth Manager, BlueBoard, BlueChat. The screen, as I already have said in the beginning, with the resolution of 320 on 320 pixels, with forward bright illumination. It is interesting, why Palm till now prefers a lamp of illumination, settled in the front, when Sony already for a long time has made and has proved to everybody, that the back illumination is much better. The Li-Polymer 900 mAh battery is fixed. Power consumption of Palm Tungsten can be compared with m515 model, which is rather creditable, taking into account the increased frequency of the processor. The company declares that at use of the computer on the average 30 minutes in day, at average brightness of illumination, the charge of batteries should suffice for a week. A trouble is only in, that tests are not always coincided with reality and, under condition of infra-red port, Bluetooth and God forbid, MP3-player use, the battery become empty simply catastrophically - anyway, additional charge is required daily. Universal socket in the bottom part of the computer is same, as well as in all m-series (except for m100 and m105 computers), so all accessories from the previous handheld computers will approach. Once again these words confirm the cradle included in the standard. Successful and, naturally, original model of a pocket PC. It is not necessary to doubt, that Palm admirers will pay attention to it. It is insulting only, that for its normal work, it is necessary to upgrade it, installing programs more suitable for work, than built in operational system, to select utilities, to find musical players for realization of all opportunities and operational system and hardware. To me Tungsten has more likely pleased, anyway, it is one of those pocket computers which I would choose for personal using, taking into account, that I know, what programs are necessary to be filled in it for normal work.